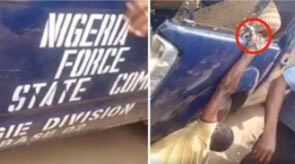 Some men of the Nigeria police force in Edo state have been filmed as they dehumanised an unidentified man on Sunday, May 14. The officers cuffed the man to the door of their moving van and dragged him along the road as they drove in Sopkonba junction, Benin City. 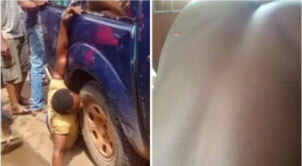 The story was discovered after a Facebook user, Irabor Franklyn, shared the story on his page. According to Franklyn, the officers brutalised him and his friends after they tried to plead with them to leave the man alone. No matter what a civilian does, should police officers have the power to treat people with injustice? Comment to tell us your opinion! Watch the video below and feel the atmosphere!